BABY DINK was designed as a tender for Bahama Mama shown here and later in the catalog. She is stable, tows well and is light enough hoist on board a larger boat. She is suited for a small outboard but will be a delight to row and a real please to use about the beaches and waterfronts. She is easy to build in tack and tape construction using plywood and epoxy. Just lay out the dimensions on a sheet of plywood, cut and put her together. Construction is suitable for first time builders. Plans include panel dimensions, assembly illustrations and construction details. No lofting is required. Estimated cost for quality construction materials is $500. 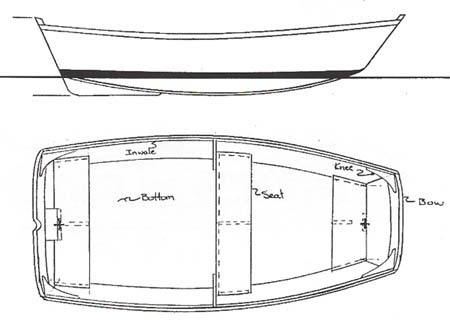 This cost includes a high level of outfit and finish you can be proud of after putting the effort into building this fine boat. 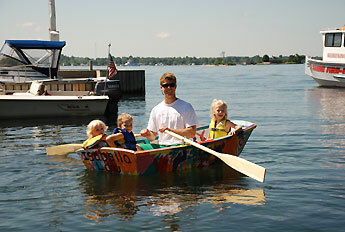 Purchase Construction Plans for the BABY DINK for $50.00 for delivery by US Postal Service.